Thanks to a competition I agreed to run for @PGUK I have now discovered a FABULOUS photography blog. Em @SnowingIndoors was one of the entrants for the competition, and is also now, the winner! I do not did not follow her on Twitter and went to her blog curious. She entered via a comment on the blog post, which linked to her blog. Em, when I arrived at your blog, I was blown away by your photography, and I hope you have a wonderful Mother's Day. I will be dropping P&G a line, so that the below will be winging it's way to you, as soon as possible. Mine was delivered yesterday but when hubby went downstairs to open the door he came back up for his keys and by the time he'd gone back down the courier had gone. Luckily they left the item with our local post office, so I was able to go and collect it today. I am really happy with the goodies I was sent (photographed by yours truly above) and I hope you will be too. My shampoo AND conditioner are both very very nearly empty and it was great not having to go to the expense of replacing them today, when food shopping seems to be getting dearer every week. At 40 I am not getting any younger so the Olay products will come in VERY handy. My mascara needs to be thrown in the bin, so that won't go amiss either. Olay Regenerist Night Recovery Cream: "Regenerist Night Recovery Cream provides the look of a mini-lift in the morning. This formulation, with our exclusive Amino-Peptide complex and Olay moisture, hydrates your skin throughout the night and promotes surface skin cell renewal". Disclosure: my compensation for hosting this competition was the products pictured above. All words and opinion are my own. 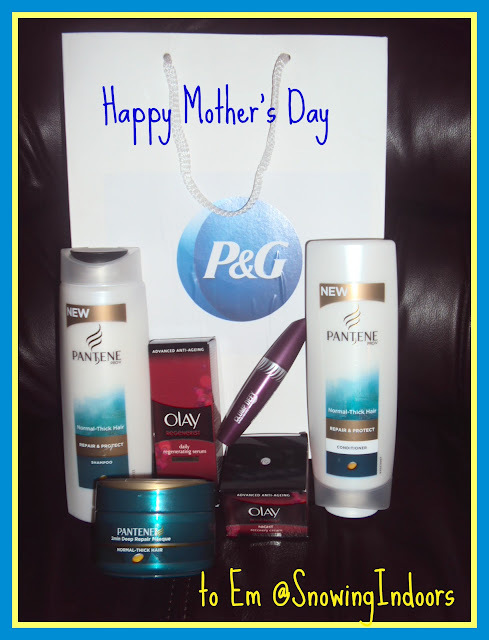 All I was asked to do, via the competition, was to share the P&G Mummy Effect Facebook video, which is really cute! my heart... Thank уou! Where are уour cοntaсt dеtails though?